The 32-year-old’s deal was due to expire this summer. 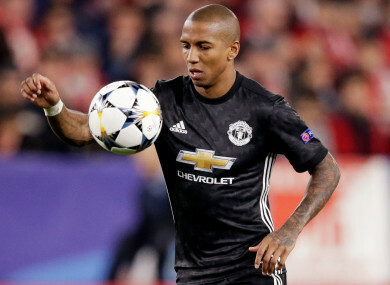 MANCHESTER UNITED HAVE triggered a one-year contract extension clause on Monday to retain the services of utility man Ashley Young until 2019. The 32-year-old’s deal was due to expire this summer, but United have confirmed they have taken up the option of an extra 12 months. Young, who joined United back in 2011 from Aston Villa, has rejuvenated his career at Old Trafford under Jose Mourinho as the former winger has made the vast majority of his 30 appearances this season at left full-back. Indeed so impressive has Young’s form been that he has been included in Gareth Southgate’s England squad for friendlies later this month against the Netherlands and Italy. Email “Manchester United trigger one-year contract extension for Ashley Young”. Feedback on “Manchester United trigger one-year contract extension for Ashley Young”.